Sencha (煎茶) is a Japanese green tea, specifically one made without grinding the tea leaves. The word "sencha" means "decocted tea," referring to the method that the tea beverage is made from the dried tea leaves. This is as opposed, for example, to matcha (抹茶), powdered Japanese green tea, in which case the green tea powder is mixed with hot water and therefore the leaf itself is included in the beverage. Depending upon the temperature of the water in which it is decocted, the flavor will be different, and this also is the appeal of sencha. With relatively not too hot water, it is relatively mellow; with hot water, it is more astringent. Unground tea was brought from China after matcha (抹茶, powdered green tea). Some varieties expand when steeped to resemble leaf vegetable greens in smell, appearance, and taste. a lot is made in Kyushu, Tokoname . . .
From the kiln Yudachigama 夕立窯. 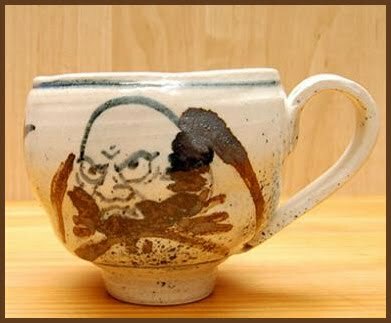 This cup can "korokoro" tumble around like Daruma, getting up eight times.
. Baisaoo, Baisaō 売茶翁 Baisao, "Old Tea Seller"
賣茶翁 （ばいさおう） / 高遊外 Ko Yugai (1675 – 1763) . The veneration of Baisao during and after his lifetime helped to popularize sencha tea and led to the creation of the sencha tea ceremony. 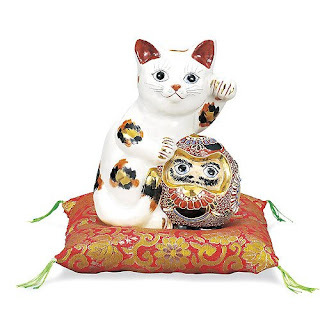 Karatsu is one of Japan's best-loved pottery styles. Like other styles, it derives its name from the city it's located in. Karatsu, meaning "China Port," is located in Saga Prefecture on the island of Kyushu. Karatsu pottery traces its roots back to the 15th century, but it is generally agreed that it matured in the latter half of the 16th century. This is due to the influx of Korean potters brought back by Lord Hideyoshi in what is often called the "pottery wars." 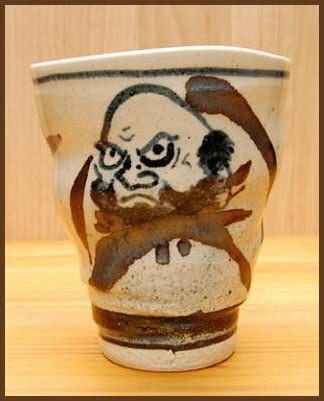 Tea was favored among the lords at that time, with a Karatsu chawan being a most desired style, two other cherished styles being Raku and Hagi. 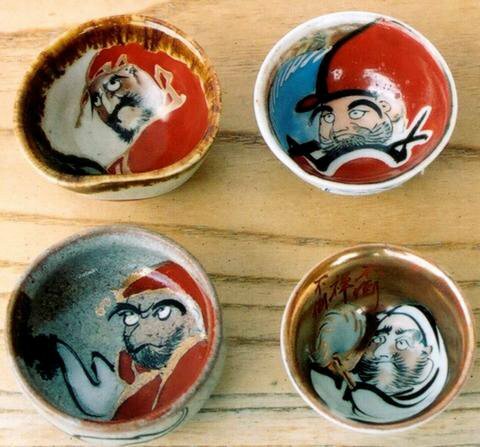 The only family dating back to that time still in the Karatsu pottery world is the famous Nakazato family. They have an unbroken lineage of fourteen generations and are one reason of the continued success of the Karatsu style. 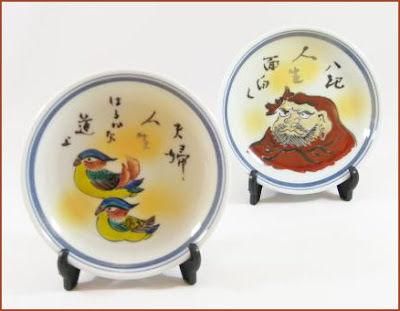 Just a short walk from Karatsu station is the studio-museum-gift shop of the head of the Nakazato family -- he is always given the family potting name of Taroemon (Ta-row-eh-moan). Today we have Nakazato Taroemon XlV (formally known as Tadahiro), who took the Taroemon name on March 4, 2002. His father is now known as Houan. The compound has a very traditional gateway and as soon as one passes through it a large Daruma is there to greet you. 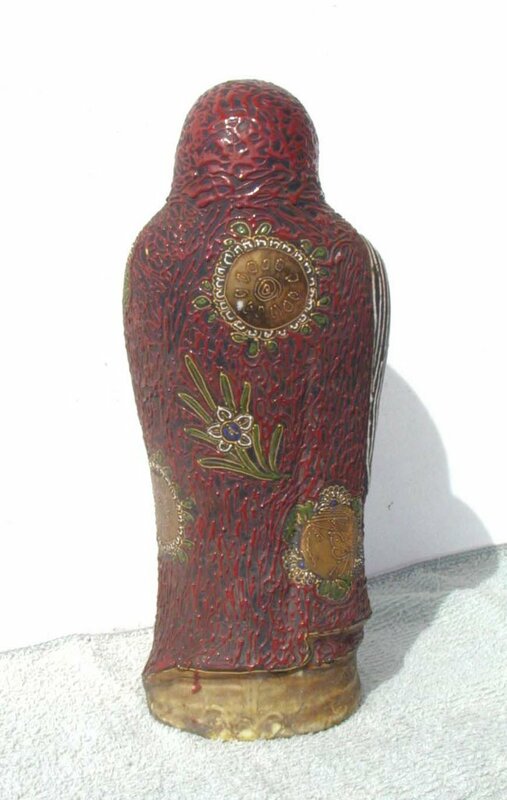 about 80 cm high, the eyes protruding. 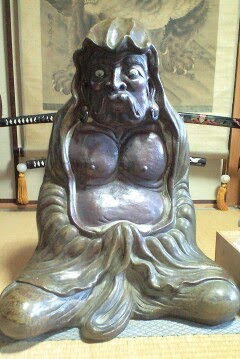 I have a very similar statue in my collection. 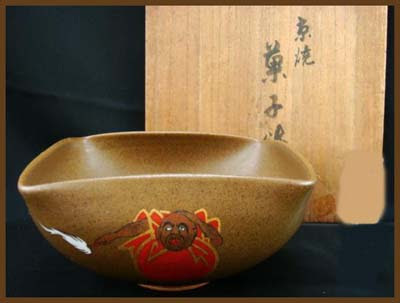 A variety of styles of Karatsu ware exist. Various images (flowers, plants, birds, mythological creatures, etc.) 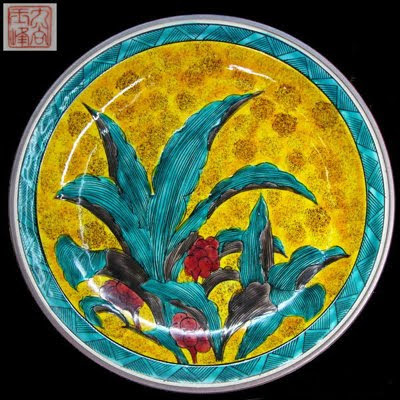 are painted onto the piece using an iron-based underglaze, then the piece is fired with a semitransparent gray glaze which allows the underglaze to show. This style is known for its earthy color and simple design. 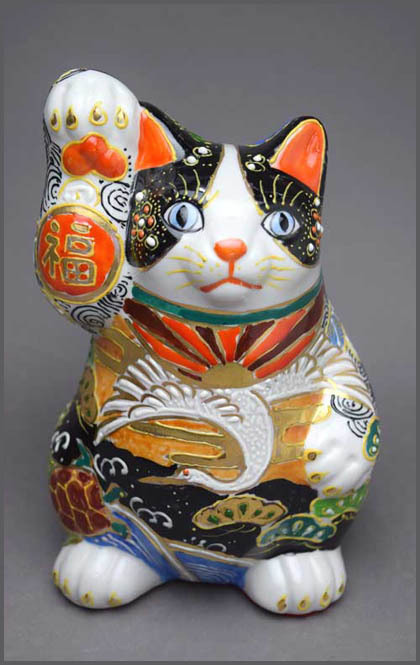 This traditional style was introduced by one or more potters brought from the Joseon Dynasty during the Japanese invasions of Korea. 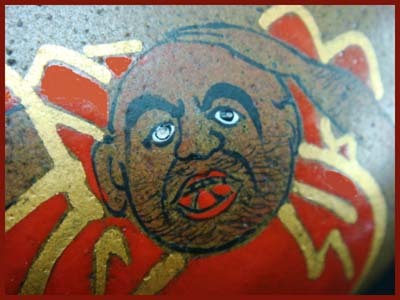 It features a black glaze placed under a white glaze which has been fired with straw. The two glazes run together and give a feeling of opposites.
. Yakimono 焼物　Daruma in and on pottery . Here is a sample from Kyoyaki pottery 京焼. It is a small pot to serve sweets for the tea ceremony. 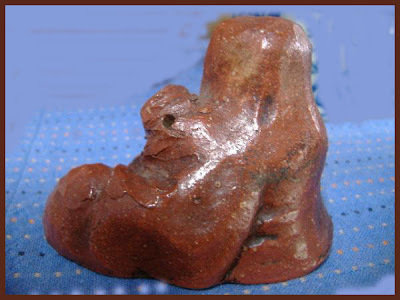 About 8,5 cm high and 17 in diameter. ..... tetsuke tonsui 手付とんすい with a handle. Portionsschale. Tin is close to silver, and its shining surface gives the food in summer a cool appearance. With some dewdrops on the plate it is even more refreshing. namasu is a dish of finely chopped raw fish and vegetables soaked in vinegar. After the meal he was sitting on the veranda and observed how the white dishes were faintly still visible in the darkness. It is just a normal scene of daily life, but near his death, he seemed to enjoy just to be there. this is almost the color of Japanese negi 葱 long green onion leaves .
. Nori 海苔 laver seaweed .
. sara　皿　Plates with Daruma Design .
. mamezara 豆皿 small plates "beans size" . 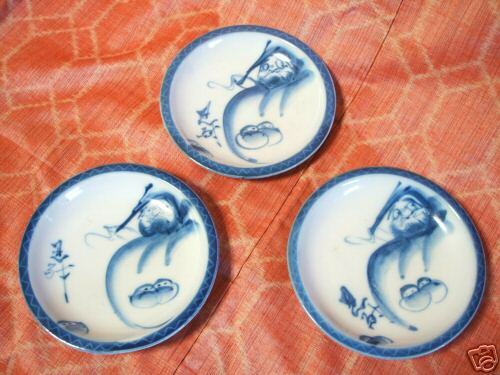 An interesting blue and white Imari plate 3 pc set decorated with Daruma , from early 20 century. The design is very unique. 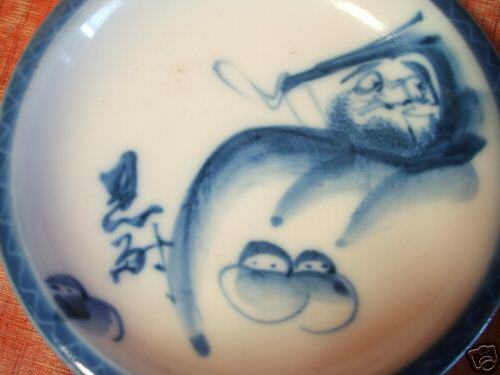 Very fine brushwork on Daruma's expression. Backside has 3 bats design. 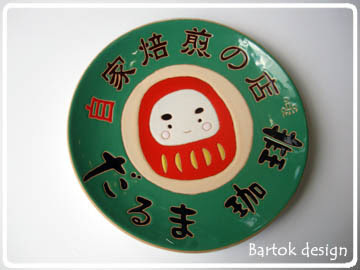 Daruma plate with Shinto motives ! 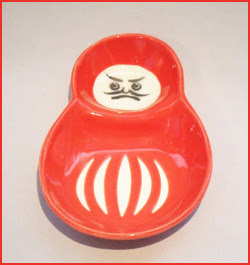 CLICK for more Daruma plates !
. 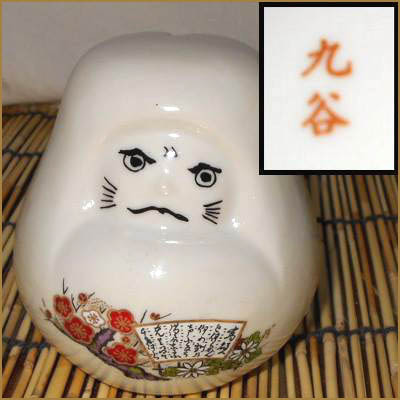 hachi はち【鉢】 bowls of all kinds . The knowledge of calligraphy is an important step in the understanding of Japanese culture. Calligraphy is not merely an exercise in good handwriting, but rather the foremost art form of the Orient. It is the combination of the skill and imagination of the person who has studied intensely the combinations available using only lines. In the West, calligraphy was intended to suppress individuality and produce a uniform style. Japanese calligraphy (sho 書) attempts to bring words to life, and endow them with character. Styles are highly individualistic, differing from person to person. Japanese calligraphy presents a problem for westerners trying to understand it; the work is completed in a matter of seconds so the uninitiated cannot really appreciate the degree of difficulty involved. However, bear in mind that the characters must be written only once. There is no altering, touching up, or adding to them afterwards. Various types of Chinese-character scripts, or shotai, representing the historical development of writing in China, are practiced, such as tensho or archaic script, and Reisho or clerical script. More common is kaisho or block-style script, perhaps the most popular style, since the characters are easily recognizable. Gyoosho or running-style script is created by a faster movement of the brush and some consequent abbreviation of the character. Soosho or grass-writing is a true cursive style that abbreviates and links parts of a character, resulting in fluid and curvilinear writing. Now let us take a closer look at the water droppers. 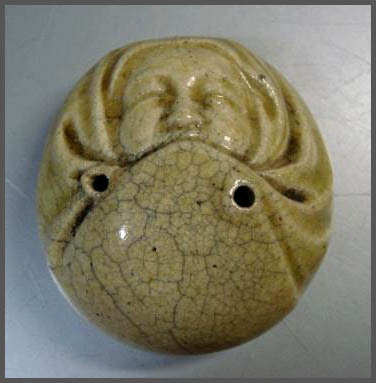 They come in many forms and shapes, usually made from ceramics or metal.
. . . CLICK here for Photos of many more samples ! 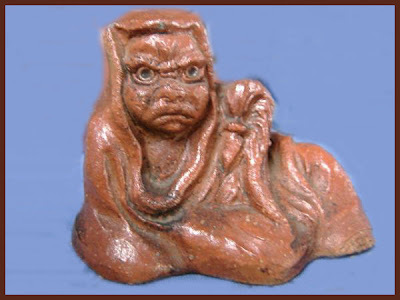 Ofuke-yaki 御深井焼 is from an old kiln of Nagoya, adjacent to the castle. In the year 15 of Keicho Era (1610), feudal lord of Owari Tokugawa clan, Mr. Yoshinao Tokugawa (Mr. Ieyasu Tokugawa's child) called to Akazu village (present Akazu, Seto City) for revival of Akazu kiln, the potter who had come out to other districts to avoid war. potters in Akazu village, Nihei and Tousaburo, to build a kiln at "Ofuke-maru" (a place inside the castle) for firing "Oniwa-yaki"earthenware. 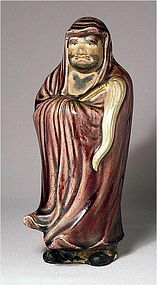 Later, Tahei, potter in Akazu joined and the three potters were called the big three or "Okamaya". 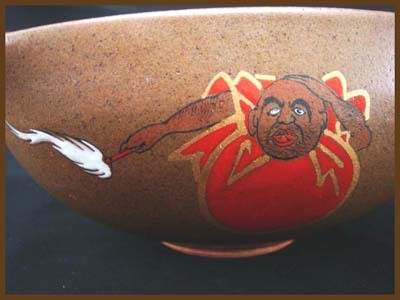 Akazuware have been fired in same way as ancient technology and technique. 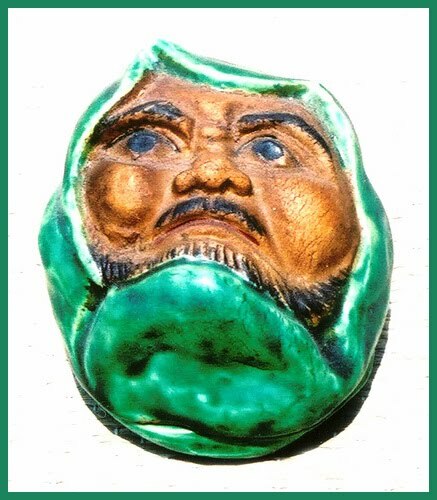 This is because the above big three "Okamaya" were going to Nagoya Castle to fire "Oniwa-yaki" until "Oniwa-yaki" had been abolished at a law of replacing "Han" (feudal domain) with "Ken" (Prefecture) in Meiji Era. This should reflect support from great Tokugawa Clan. Different from "Oniwa-yaki", "Ofuke-yaki" earthenware was instructed by Mr. Chin Gen Pin (naturalized Japanese from China). 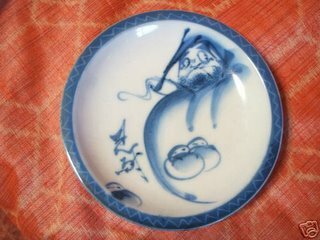 "Ofuke-yaki" was fired wtih light blue ash glaze and with decoration manner called "Annan-Gosue". 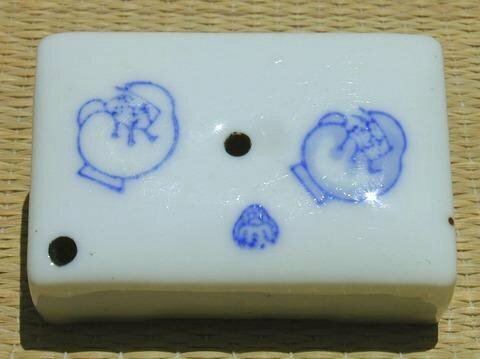 This light blue ash glaze is called "Ofuke-yu" considred to be most difficult one of the glazes in Akazuware. 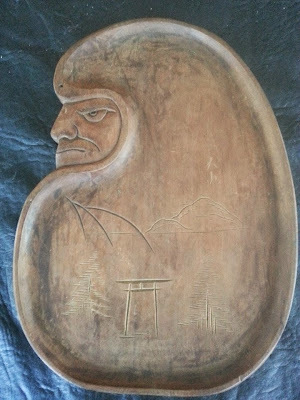 Let me introduce you to one of my favorite free spirits of the Edo period. Meet Hiraga Gennai (1728 - 80), a famous naturalist, experimentator, inventor and writer. 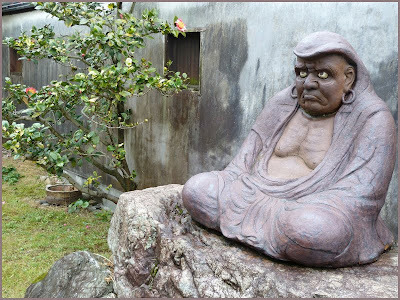 He was born in the Takamatsu domain as the son of a low-ranking samurai, moved to Nagasaki to study herbal medicine and in 1757 went to Edo to continue his studies and to write humorous books. He experimented with many natural substances, trying to make cloth of asbestos, thermometers and Dutch-style pottery. 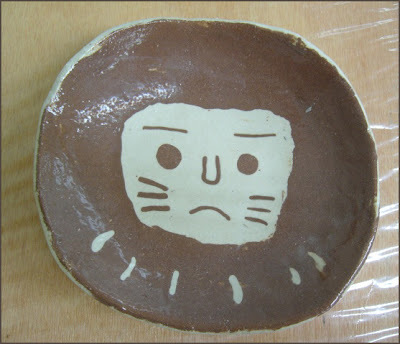 Soon he made his own style, Gennai-yaki. His activities included surveys for ore deposits, wool manufacturing and Western oil painting with other Akita painters. He also experimented with electricity and tried his hand at many inventions. In his later years he showed signs of psychological deterioration and died in prison after he killed one of his disciples in a fit of madness in 1779. He is still well known today as a searching spirit and great experimentor and researcher of nature. The Gennai kiln is believed to have opened in the mid Edo period (Hoeki Era, 1753-63) in Kagawa prefecture. 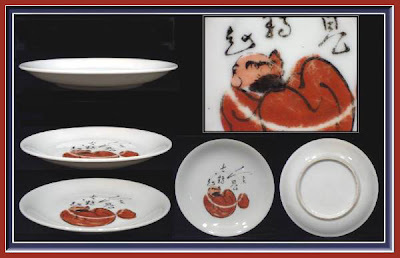 The kiln produced a lightweight pottery in a style of South Chinese wares, and is best known for low relief plates depicting maps of Japan in typical Gennai glazing of yellow, brown and green. 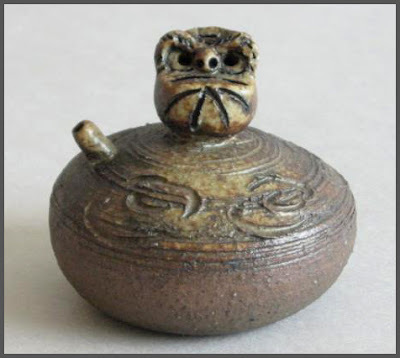 From his bout with pottery we have this small water dropper in the form of a reclining Daruma in three colors 三彩達磨. 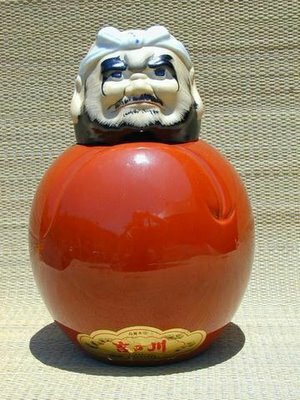 This or similar forms of a Daruma leaning back are still used today in Kutani, as you can see from the piece of my collection. It is customary to eat broiled eel on the day of the ox in summer (doyoo no ushi no hi, sometime in late July). This is because eel (unagi) is nutritious and rich in vitamin A, and provides strength and vitality to fight against the extremely hot and humid summer of Japan. 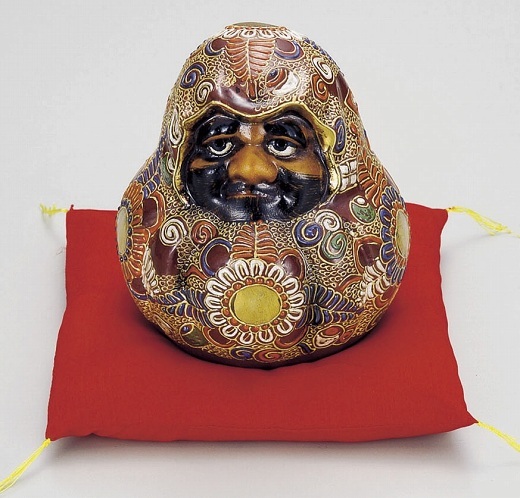 The man who invented this well-loved custom is the famous scientist of the late Edo period, Hiraga Gennai. Here is a short report about Gennai'a experiments with electricity, a subject that fascinated him greatly. Hiraga Gennai witnessed the demonstration of "Elekiter" on his second visit to Nagasaki in 1770 and he made up his mind to reproduce it. 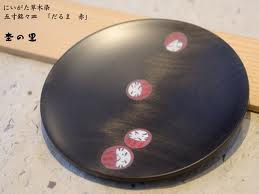 The mechanism that induces static electricity by rotating a handle in the side of a box is reported to have obtained a great popularity as "A Wonderful Thing" in Edo at that time. Hiraga Gennai was involved in the project of drying out the swamp at Inbanuma along the river Tonegawa 利根川 for land reclamation. Legend knows that Gennai died because of a curse of the Demon of the Swamp. Lake Inbanuma was created by the natural damming of a small valley in the Shimosa Plateau, Chiba, and originally covered 21.3 square kilometres. After land reclamation projects, similar to those carried out on the swamp Teganuma, it now covers 13.1 square kilometres. Receiving orders from clans (han) of the Tokugawa Era, Hiraga Gennai, an early exponent of so-called Dutch learning (rangaku) during the Tokugawa Period, created fireproof coats. He also produced "Electriciteit" (electricity) by applying ideas imported from Holland to create a friction generator for medical purposes. Hiraga's ingenious creativity still inspires us today. 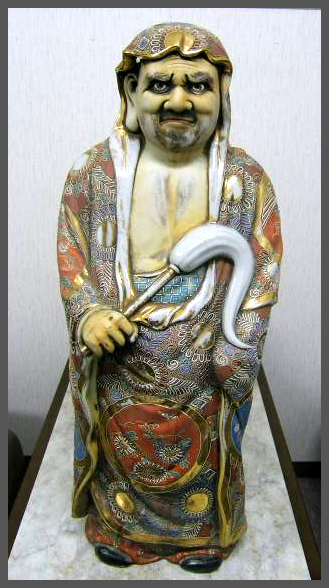 Using the powers of imagination to create new things --- the spirit of Hiraga Gennai lives on at Hiraga Machinery Mfg. 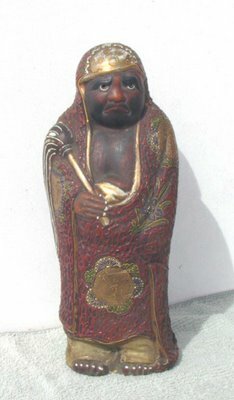 Co., Ltd.
Matsudaira Yoritaka 松平頼恭　(1711 - 71).
. Tanuma Okitsugu 田沼意次 (1719 - 1788) . 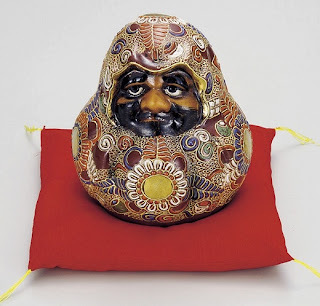 compiled by Matsudaira Yoritaka, the Lord of Takamatsu in 18th century Japan. 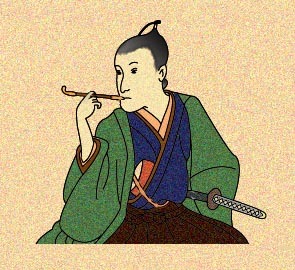 Matsudaira Yoritaka noticed Gennai's abilities in cultivating ginseng — an activity in which Lord Yoritaka enthusiastically participated . . . It seems he did not really "invent" most of the items related with his studies, but got them from the Dutch in Nagasaki or read about them in European books and repaired things as best as he could. Here is a nice pair made of wood and laquer. 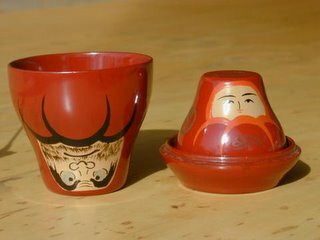 It starts of as one figure, and develops into a set of two cups with a small tray, almost like the maryoshika dolls of Russia. Both heads are made flat so they stand as a sake cup. Nr. 15 to 17 in the Album. This piece is rather large, almost 25 cm. 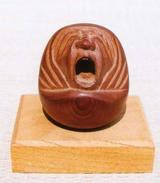 I have written about a similar small one in the story about Takasago. 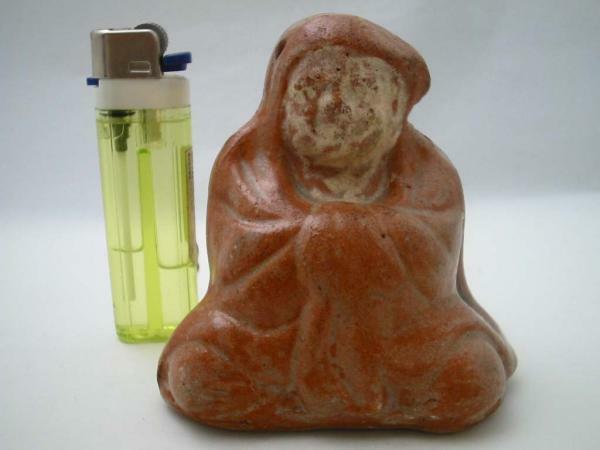 At first it looks like a small statue, then you take of the head and have the first sakazuki. Next comes O-Kame, off and used as a sakazuki for the wife. Again, the heads are formed rather flat so the cups can stand. Nr. 09 - 12 in the Album. There are more in my Album, Nr. 18 to 21. The very small cups for ricewine are called sakazuki　杯. Somewhat bigger versions are guinomi　食いのみ or o-choko.
. . . CLICK here for guinomi Photos ! 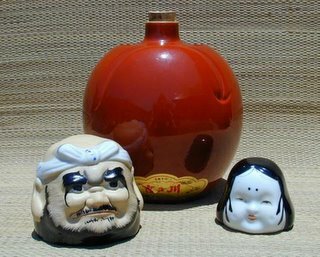 Japanese Sake Containers - A bit on the KITSCH side. 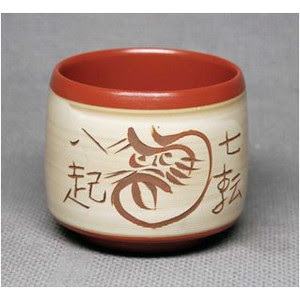 regarding the up-and-coming hobby of collecting Japanese Military Sake Cups (guntai sakazuki). 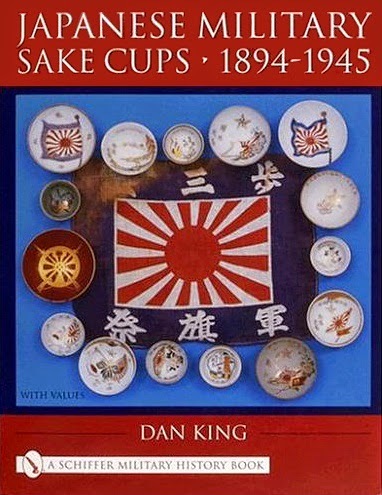 It consists of 144 pages of useful information and photos regarding the usage and history on Japanese Army & Navy sake cups used by the military for roughly 50 years. The book covers cups, sake bottles, sake trays and commemorative items. 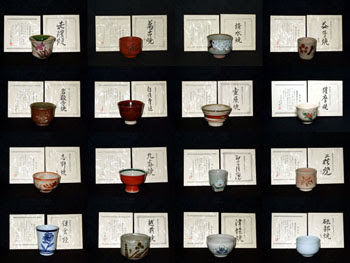 The cups photographed in the book are the result of the author's 20 years of collection WWII Japanese militaria with a focus on sake-related items. The attraction of these cups is not only hand made, hand painted craftsmanship but their historical significance as well. Many cups will have the owner's regiment, name etc..on the cup which gives the collector the option of researching the cup to discover where the original owner was stationed during the war. The Japanese military machine chose to revive several age-old samurai traditions including the use of hand-forged swords, long helmet straps tied in the samurai style, and the consumption of ceremonial sake before a battle. 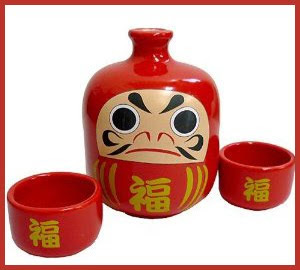 The sake was consumed in a solumn ceremony, with no words spoken other than a reverent, singular "Kanpai" by the leader. my shadows and I a party of three. 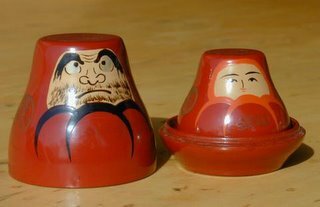 Bashô, too, drinks alone, but has the companionship of "the three names": Li Po and his two shadows of the same name (one on the ground, one in the wine cup). 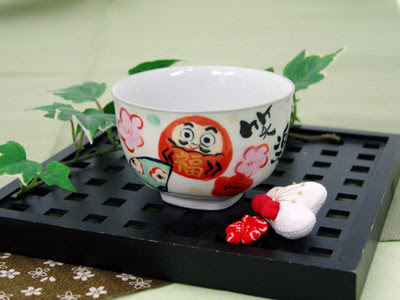 Oseku points out that we should also note the puns in this hokku: Puns on "moon" (-zuki cup = tsuki moon) and "full" (mitsu three = mitsu to fill).5 Rather than provoking humor directly as a pun in English might, these implied words simply capitalize on the profusion of homonyms in Japanese to provide further clues to the poem’s hidden seasonal topic. 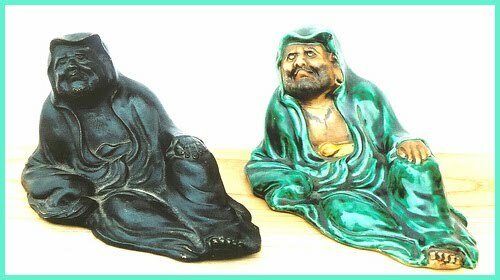 On that night, there were three uninvited guests at Basho's home, all with the name of Shichirobei 七郎兵衛. Basho had intended to drink alone in memory of Li Po, maybe, but the drunken visitors joined him.
. Li Po, Li Bo, Li Bai 李白, lived 701 – 762 . Drinking all alone, no one else. Basho substituted Li Po’s three friend, the wine cup, his shadow and the moon for three actual friends. According to Wyatt, Basho's haiku was written in 1685, a time period that "the haikai world was swept by the "Chinese style" (kanshibun-cho)" . Basho was well-versed in Chinese classics. Read in the emotional context of his poem ("this fine evening"), "three friends" could be also read as an allusion to a popular Chinese idiom, three is a crowd, contrasted with Li Po's lonely lifeworld (himself, his shadow, and the moon). "Three people" (or "a party of three;" Chinese: 三人) refers to the moon in the sky (, which connotates "Heaven"), Li Po's shadow on the ground ("Earth"),and Li Po himself ("Humanity"). 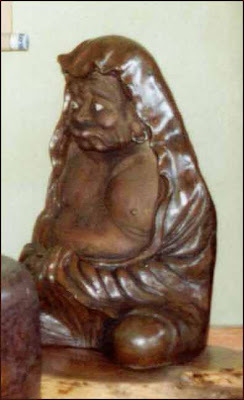 Nankaku was a student of one of the most important Confucian scholars, Ogyu Sorai (1666--1728), who emphasized an unmediated understanding of Chinese classics, and whose thoughts had highly influenced the leading painters of nanga (also known as bunjinga, which literally means literati painting). Nanga was a school of Japanese painting modeled on the Chinese Southern school of painting, to which Buson belonged. Nankaku specialized in Chinese classics, and one of his greatest achievements was the Toshisen, a Japanese edition of one the most influential Chinese verse anthologies, Tang Selected Poems. The Toshisen had long served as one of the foundational texts for the bunjin movement. The concept of “wenren” is highly related to that of “renwen” (wenren written inversely in Chinese). It can be found in the Yi Jing, also known as the Book of Changes, which is one of the oldest of Chinese classics. 36 Renwen can roughly be translated as meaning the "arts of humanity," one component of the three-fold Chinese universe: heaven, earth, and humanity. It "embodies all that is of the highest value to the society, and interacts with the other two: the spiritual and philosophical (tianwen) and the environmental and ecological (diwen). A person cultivated in renwen was originally called wenren. Phenomenologically speaking, "three people" constitutes Li Po's lifeworld (German Lebenswelt understood in the Husserlian sense of the word). Basho's allusion emotionally and tonally changes the connotative meaning of "three people." can be seen as a kigo for autum.